The day was pretty much perfect for cruising the ICW. It was warm but not too warm and the winds were light to moderate. This section is protected waters so we were not concerned that the weather would turn. Besides, the Weather Service forecast a nice day, so we just relaxed and enjoyed the trip. Even crossing the harbor at Beaufort/Morehead City was uneventful and the many, many small boats usually darting back and forth were missing. The sun came out and warmed things up nicely. But that would change somewhat once we settled into our anchorage for the night and checked the weather. The 20 miles down Bogue Sound would be our largest body of water to transit this day. This is another very shallow Sound and depths outside the channel are mostly 1 to 2 feet. It is very important that you stay in the marked channel and at times that can be challenging. There seems to be a constant cross current rather than the normal currents that run up or down the Sounds that we are used to. This cross current can push the boat out of the channel and into very shallow water rather quickly if you are not paying attention. With the winds out of the east and northeast, vigilance was even more important. 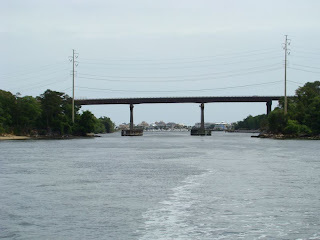 But we made it down the Sound without mishap and soon crossed Bogue Inlet and passed the Swansboro marinas. If we needed fuel, Casper’s Marina usually has the cheapest fuel prices in this area. Continuing south, we were amazed at the development along the waterway and the mansions, one after another, that were lining the shoreline. Obviously, many have not been affected by the economy for the last few years. 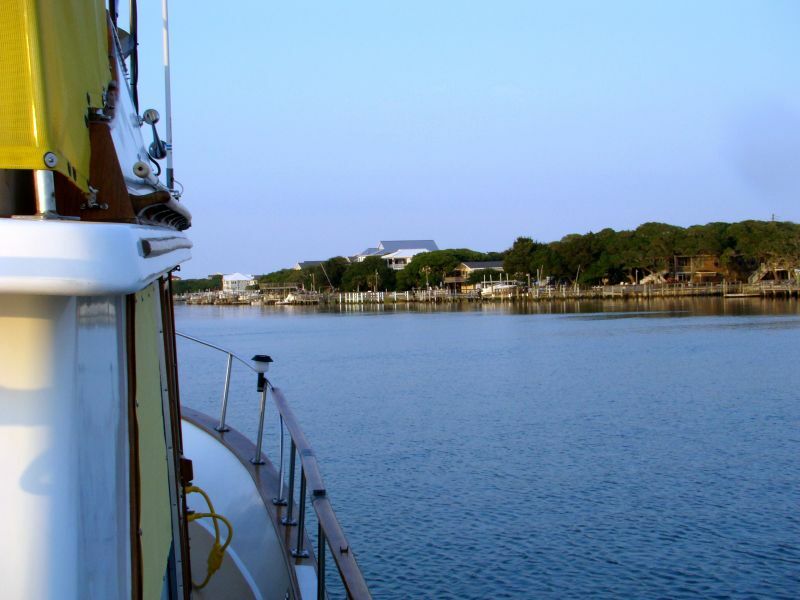 Our destination for the evening would be a new anchorage for us just north of Topsail Inlet. The entrance to the creek that goes behind the spoil islands and runs along the barrier islands is located at statute mile 263.1. Did I forget to mention that we were making excellent time? The channel is well-marked and deep so getting in was no issue. 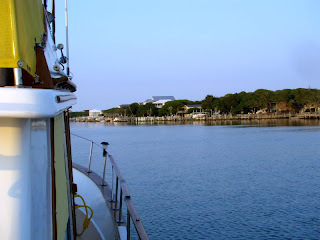 We had to deal with a trawler full of guys, mostly of very young ages, constantly stopping in the middle of the waterway, diving off the flybridge, running around in an inflatable and urinating off the stern of the boat right in front of us. And wouldn’t you know it, they turn in just as we did and stopped right in the middle of the channel. We let them know we were not very happy and they pulled off to the side and let us pass. We kept our fingers crossed that they would not come in and anchor next to us, and they kept going, thank goodness. We anchored in a wide spot near red marker R “14” in 7 to 8 feet of water once the tide went out. One other powerboat was anchored some distance away and a large sailboat came in later and anchored a bit farther south of us. A big surprise came when we had the Satellite Dish set up and the local stations tuned in on the TV. We watched the local news as they announced that severe thunderstorm and tornado warnings were in affect just south of us in the Southport and Myrtle Beach areas. Southport was our destination for the next day. This system would pass just south of us, but behind it and moving from the northwest to the southeast was another nasty looking system with severe thunderstorms. That system would be heading our way overnight, of course. We tried to get some information from the Weather Channel but there was severe weather in Minneapolis, so they were not providing any information for any other areas. We did get a decent WiFi connection so were able to get online and check the national radar and a few other resources. It was going to be close and would not arrive until 2 AM or later. We set out some additional anchor rode and settled in for the night. We could see lots of lightning just offshore and south of us from the first batch of storms. At times like this, it is difficult to get a good nights’ sleep and I am typically up about every hour checking on things and scanning the skies. At about 3 AM, we were getting some light drizzle and at about 4 AM, the wind picked up a bit. But once again we lucked out and both systems passed just south of us; we woke the next morning unscathed. Another bullet dodged as the storms were severe where they did hit and baseball size hail had been reported in some localities. 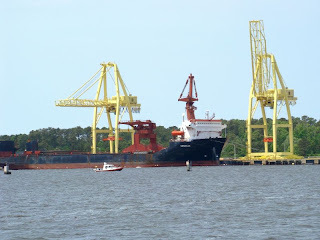 It was time to prepare for the day and a trip down the Cape Fear River, which can be, let me say, exhilarating, depending on conditions. The NWS guesscast was for east 10 to 15, which might not be too comfortable. Stay tuned.